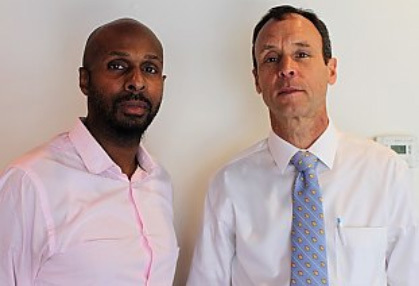 Demetrius Anderson and his attorney, Michael Dolan. Demetrius Anderson is one step closer to being fully free. A federal prosecutor has joined the quest to keep Anderson from returning to government supervision thanks to a U.S. marshal’s glitch. Now a federal judge has to make the final sign off. Until that happens, Anderson remains a bundle of nerves. The 43-year-old city employee recently learned he might have to leave his home in New Haven and go to federal prison in Philadelphia all because of a decade-old miscommunication between the federal and Connecticut state judicial systems. He thought he had finished serving his time 13 years ago when he finished a term in a state facility. He rebuilt his life in New Haven and has thrived — only to find out that marshals have discovered that they forgot to bring him to a federal prison to serve out another 16 months for related offenses. His quest to avoid that fate has become a national news story. He no longer needs to worry about returning behind bars, but he still faces possible probation. Last Tuesday morning, U.S. Attorney for the Eastern District of Pennsylvania William McSwain and Assistant Federal Defender Rossman Thompson, Jr. filed a joint motion in Philadelphia federal court in which they urge federal Judge Paul Diamond to vacate an arrest warrant issued Anderson and to waive an old unserved sentence of three years of supervised release. The motion also informs the judge that the federal Bureau of Prisons (BOP) formally nixed Anderson’s 16-month federal prison sentence last Thursday, citing his good behavior and clean record in the 13 years since he got out of state prison. Wednesday afternoon, Diamond signed an order continuing Anderson’s hearing from April 4 to May 1. Diamond has still not acted on the joint motion that would dismiss Anderson’s supervised release sentence. The joint motion from the district attorney and the public defender in support of Anderson’s freedom is the latest and one of the most consequential developments in a two-week whirlwind for Anderson, who works for the city’s parks system (one of two jobs) and owns a Westville condo. Click here to download a copy of the joint motion. Anderson’s attorney, Hamden lawyer Michael Dolan, said that Anderson no longer faces 16 months in federal prison in Philadelphia thanks to the BOP’s recent recalculation of his sentence. But, he said, if Diamond doesn’t sign the joint motion, Anderson must still travel to Philadelphia federal court on Thursday, when Diamond could sentence Anderson to up to three years of supervised release, also known as probation. Anderson himself told the Independent on Tuesday that he nervously awaits Diamond’s decision. He said he feels that he should not be punished 13 years after his release from state prison simply because of a miscommunication between the state and federal judicial systems. “I’m trusting on God to make man do what’s right,” he said. Since the New Haven Independent first wrote about Anderson last Tuesday, the city employee’s case has garnered national and international attention, in large part because of an in-person interview that Anderson and local attorney Michael Dolan did with CNN last Friday at the network’s New York City studio. Four days after that interview, McSwain and Thompson filed the joint motion with the federal court. The joint motion requests that the court recognize as satisfied Anderson’s three years of supervised release; that it retain the $4,140 that Anderson must pay in restitution as ordered by the original 2005 federal judgment; that it vacate Anderson’s bench warrant and April 4 federal court hearing; and that it exonerate the unsecured, $50,000 bond that Anderson paid on March 20 after federal marshals showed up at his door in New Haven with an order that he be arrested for allegedly evading prison for 13 years. The seven-page motion details just how the federal and state courts bungled the enforcement of Anderson’s federal sentence over a decade ago, leading to a bench warrant being issued in 2019 for a man who got out of prison in 2006 and hasn’t been arrested for any crimes since. In the motion, McSwain wrote that, after pleading guilty in Philadelphia federal court to two counterfeit currency charges in January 2005, Anderson was sentenced to 16 months in federal prison. At the same time that he he was being sentenced on federal charges in Philadelphia, Anderson was facing similar state charges in Connecticut. So, in May 2005, the Philadelphia federal court system returned Anderson to Connecticut state custody to serve out his Connecticut sentence. “The Marshal lodged a Detainer dated May 5, 2005 with Connecticut authorities to have Anderson returned to federal custody following his state proceedings and sentence,” McSwain wrote, “in order that Anderson could serve his federal sentence” following the completion of his Connecticut sentence. In June 2005, Anderson pleaded guilty to the state charges. He was sentenced to three years in Connecticut state prison. Anderson was released from Connecticut state prison in November 2006. He thought he had been serving his federal and state prison sentences concurrently. No one informed him otherwise. And so Anderson was let free. He spent the next 13 years rebuilding his life in New Haven, where he currently works two jobs, has a condo in Westville, and belongs to a church in the Hill. The federal court didn’t discover its error until 2018, when the U.S. Marshals Service in Philadelphia conducted an audit of unserved federal sentences. They found Anderson’s name on the list, all because the state system had failed to remand Anderson to federal custody following his release. And so on Feb. 28, 13 years after Anderson’s release from state prison and 15 years after he had initially been sentenced in federal court, Diamond signed a bench warrant for Anderson’s rearrest. On March 20, marshals arrived in New Haven to serve that warrant to Anderson. The city employee appeared before a magistrate judge in New Haven that same day, and earned his release by posting an unsecured $50,000 bond. On March 28, Diamond signed another bench warrant for Anderson’s arrest. This time, he ordered the defendant to be picked up and transported to the Federal Detention Center in Philadelphia for designation by the BOP. He set Anderson’s court date for April 4. On March 29, the BOP granted Anderson “credit for time he was at liberty” following his release from state prison in November 2006. Because of his good conduct since release from state prison, McSwain wrote, the federal government urges the court to grant as satisfied the initial sentencing of three years of supervised release, to vacate the April 4 hearing and the second bench warrant, and to exonerate the $50,000 bond that Anderson paid on March 20. And so now, Anderson must wait. For Diamond to sign the joint motion and set him free. Or for Diamond to rule in Philadelphia federal court on Thursday about whether or not Anderson must serve three years of supervised release, 13 years after the government’s mistake. “They all see it would be an injustice,” Anderson said about how both the BOP and the federal prosecutor are recommending his full release. This story first appeared April 3, 2019, in the New Haven Independent. There's a fight over nominees to the court that hears Connecticut appeals and the state is involved in 20 federal lawsuits against the Trump administration . A federal judge in Connecticut is allowing a challenge of a practice on the cutting edge of housing discrimination: The outsourcing of tenant screening to companies that effectively blacklist rental applicants using computerized assessments of criminal records.